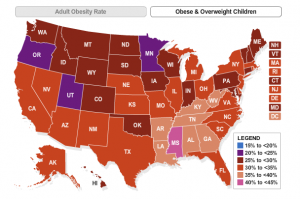 Childhood obesity is one of the most troubling modern problems. It is now known that children of women who had diabetes during pregnancy face a greater than usual risk. In fact, the rate of obesity among children whose mothers had gestational diabetes is roughly double the norm. One reason a mother’s uncontrolled diabetes can lead to a child’s obesity problems is the extra sugar the child gets in the womb. If the mother has high blood sugar levels, that means that very much glucose is circulating through her system. The woman’s body is not able to use all this sugar, and that is why it has accumulated in the blood. Yet the baby can use the sugar. As it passes into the baby through the placenta, the sugar is immediately used up by the baby. The result is that the baby gets fatter than it otherwise would. The fetus is getting more than its daily needs for sugar after all. By keeping her blood sugar levels normal, a woman can keep excess sugar from going to her baby. If she is successful, the baby may be born at a normal weight. High birth weight is just one of the factors that lead to childhood obesity. Another is that the unhealthy doses of sugar in the womb set up patterns that can stay with a child for life. These patterns are so ingrained by the time the child is born that it is hard to train them to eat normally. Even if it can be managed during the child’s infancy, things can rapidly change. As soon as the child has more control over the amount of food taken in, they will undoubtedly eat more. The child’s metabolism is geared to obesity from the start, and without vigorous intervention, the child will become obese in a short amount of time. However, there is something mothers can do about this problem, and it starts during pregnancy. If pregnant women take their blood sugar readings often, they will have the information they and their doctors need. Next they will work on control that will keep the levels of sugar in the woman’s blood to a minimum. Their babies will be healthy and have less chance of becoming obese in the future. The pregnant mother’s diet and exercise habits will have a great effect on the later health of the child. If the mother eats healthily, the child is more likely to do the same as he or she grows. It has something to do with the amount of sugar the child is used to ingesting. If a child has had no more than an acceptable amount of nourishment in the womb, later it is easier for that child to tell when they have had enough. They stop eating when their bodies tell them they are satisfied. On the other hand, a child who has been overfed in the womb will always feel hungry as they grow. This leads to childhood obesity too. Women can take charge of their diabetes control and prevent their children from becoming statistics in the battle against childhood obesity.